I always love a good time travel novel. 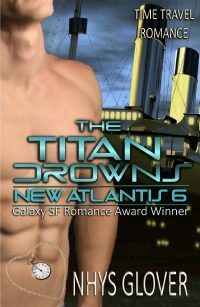 On today’s First Kiss Friday, I’d like to introduce you to Nhys Glover and an excerpt from The Titan Drowns. Happy reading and enjoy! Pia didn’t see any crew as she made her way out the companionway onto the Well Deck and then took the short flight of steps to the Poop Deck. It was cold up there at this hour. She shivered, tightened her scarf around her head and neck, scurried into the shelter Marco had told her about, and crouched down to keep hidden. What would happen to her if she was found on deck after curfew? She didn’t know. But she didn’t want to find out. After what felt like hours, she heard footsteps approaching. She held her breath and hoped it was not a crew member discovering her hiding place. Luckily, when she looked up she saw it was Marco, his white grin lighting up the night. He dropped down to her side and sandwiched in beside her so that if anyone passed it would look as if he was there alone. He wrapped the blanket he was carrying around their shoulders and snuggled in. It felt so different to be close to a warm, hard-bodied man. Except for the children, she couldn’t remember a time in the hundreds of years of her life since the LGP that she’d been this close to another human being. She could smell his male scent, subtle but intoxicating. She had to fight the urge to sniff deeper and draw his scent into her lungs. ‘Why did you come?’ His voice seemed tentative. All his usual charm and confidence were missing. ‘Tell me the happiest memory you have,’ Marco said into the silence that had fallen between them. ‘Rolling down a grassy hillside with my brother on a hot summer’s day,’ she answered immediately. ‘It was so hot we had gone swimming in the river, and it was icy because it carried the thaw from the Fiordlands. I think we fell and rolled at first by accident. Then we enjoyed it so much we kept going up to the top of the hill and rolling down it again. I was black and blue afterwards and my mother was furious with us. But it was such fun. If you try to say something when you are rolling like that it comes out all wobbly like this.’ She made her voice vibrate and wobble until Marco laughed. ‘I’m nothing special,’ she said softly. ‘You have tickets on yourself, as Jane would say, Mr Cat,’ she said indignantly, trying to pull away. ‘Nice,’ she said with a shudder. ‘I think you are nice,’ she offered shyly. She drew back a little at the shock of the request. She wasn’t sure if this was part of the game he was playing or something else. But in this moment she didn’t care. More than anything she wanted to be kissed by this handsome Italian. Something in her face must have given him the answer he was looking for because he moved slowly toward her, lifting her chin up just a little more so he could align his mouth with hers. Then he was kissing her deeply, and the thrill of it thrummed through her system like the vibration of a guitar-string being plucked. Her whole body vibrated and sang out its joy. She pulled away with a start, terrified by what she was feeling. Terrified by what this man was starting to mean to her. ‘Too much?’ he asked shakily. She was pleased to note that he too was moved by what had happened between them. She tried to climb to her feet, but his hand tightened on her arm and held her in place. ‘I am sorry; I will not do it again. Please stay. Do not leave me yet.’ His voice pleaded with her as her heart pleaded with her. And uneasily she gave in and relaxed back into her place. But now she kept as much space between them as she could. ‘Was that so bad?’ he asked, his obvious concern in every word. Her shock was extreme. It tore all thoughts from her mind. All that remained were his intentions. He wanted to court her. He wanted to marry her. How cruel was such an idea when she knew his fate? ‘I cannot! Do not think such things. This is madness; I must go.’ This time he didn’t try to stop her when she climbed to her feet. Then she was running across the cold deck, away from the first man she had ever wanted, away from the intensity of feeling she had lost the ability to withstand. Shy and insecure Pia Rogaland wants nothing more than to save the children. For feisty Elish Cork, it’s the promise of adventure that drives her to commit. And Karl Ontario? He’s a lab geek who never dreamed of stepping outside his medical facility, until the mission to save doomed children on the ill-fated Titanic is proposed and Fate compels him to step up. While each joins the team for a different reason, they all face the same challenges: How do they identify suitable targets for retrieval to their endangered Utopian world? Once identified, how do they avoid being labelled insane when they attempt to convince those targets that the “unsinkable” Titanic is about to sink and their only hope of survival is to time travel to the future? And if that isn’t enough, how do they each then deal with finding and possibly losing the love of a lifetime in a few, fateful days? For sweet Pia, who falls in love with a man she’s not allowed to save, this last challenge might prove her undoing. As the clock ticks down to disaster, will any of the ill-fated victims of the Ship of Dreams live long enough to be part of the salvation of the human race, or will more lives be forfeited trying to carry out this audacious mission? After a lifetime of teaching others to appreciate the written word, Aussie author Nhys Glover finally decided to make the most of the Indie Book Revolution to get her own written word out to the world. 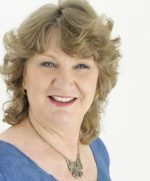 Now, as an Amazon Best Selling Historical Romance author with over 100,000 of her ebooks downloaded internationally, and as a winner of the 2013 SFR Galaxy Award for ‘The Titan Drowns’, Nhys finds her words, too, are being appreciated. These days she makes her home in beautiful Durham County, England, where she “lives the dream” by spending most of her waking hours (and some of her sleeping one, too) writing the kind of novels she loves to read. The ones that are a little bit steamy, a little bit different, and wholly romantic. Wow! I’m so glad this was posted. I’ve always been fascinated about time travel stories and this one around the sinking of the Titanic is a definite must read! Thank you so much, Nhys, and you’re welcome on my blog any time!